You know why I sometimes question people who absolutely KNOW they are right and have the correct answer? Because, at various times in my life, I was absolutely certain I knew the right and correct answer. Except after some time and upon further review, I was wrong. You want to know when I was wrong? Or maybe you already know when I was wrong…there have been many examples. This weekend, I was again clearing out moving boxes (oh, there are so many more to go still) and I came across some old USB sticks. Not knowing what was on them, I plugged them in and came across a file that said “Elevator Speech”. It was written in 2007. I knew what an elevator speech was and what it was supposed to convey. And evidently, at that time, I had an idea for a dandy elevator speech. Two things immediately happened when I started reading what I wrote in 2017. First, I heard in my head the words blah, blah, blah. I was critiquing my own prose and I hated it. I also realized that I am pretty sure this quote never saw the light of day because I never remembered saying it to anyone (thank God!). Second, the following phrase popped into my head like a lightening bolt. Evidently, the correct answer for my elevator speech had been gesticulating in my head for 10 years, picking this weekend to emerge. Why do I tell this embarrassing story on myself? First, the older I get, the less embarrassed I get. Further, I am not so unique or special that I could be the only voice-over talent (or even small business owner) that this sort of thing has happened to….in fact, we all make marketing mistakes. We come up with ideas that we think are brilliant or at least perfect at the time but upon review, we realize the idea was mediocre or just bad. Combining the following truths – many voice talents specifically think I know ‘so much’ about marketing along with the fact voice actors are so intimidated by doing marketing – led me to the conclusion that I wanted to show that mistakes happen to everybody. Don’t be afraid of making a mistake, be assured you will make a mistake…but know you’ll also come up with some great stuff too along the way. Success, I think, is being able to tell the difference. We have evolved over our history (in big ways and small ways) because we tried new ideas, because we had faith in our ideas and because we had faith in ourselves. 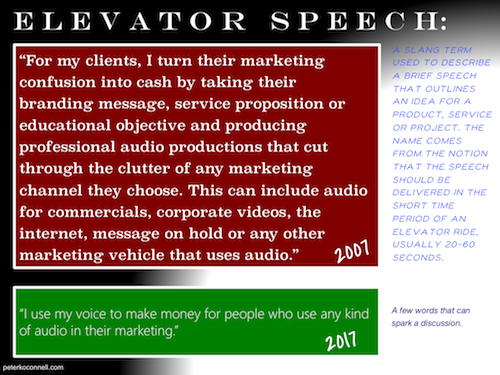 My 2007 elevator speech looks to be a bit of stinker now but it’s poetry compared to those who didn’t even make the effort to better communicate their business message to their consumer. Make the effort, take the risk. The reward is not only in the succeeding but also in the trying.